A few weeks ago I received an e-mail from a major chain asking me to post an article about the proper sampling procedures for Romaine Hearts. They were concerned because they were finding the USDA inspectors were not being consistent, from DC to DC. For example, some USDA inspectors were inspecting the entire carton of Romaine Hearts, opening up every consumer package, inspecting every romaine plant. Other USDA inspectors were only inspecting one or two consumer packages, ignoring the romaine in the rest of the carton. And even others were opening enough consumer bags to make a sample size of 15 plants. So what is the correct procedure? 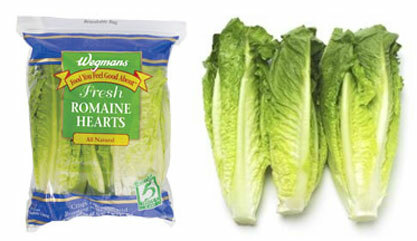 To summarize, if the Romaine Hearts are packed in a consumer package, having at least two plants, you would open up the package and inspect the plants. For example, if your consumer bag has three plants, as pictured above, your sample size would be 3. If one of the plants had decay, you would have 33% (1 out of 3) decay for that sample. You would inspect two to three consumer bags per master. You would want to look at least three masters for a quick inspection, meaning you would have 9 samples in total on your notesheet, assuming you inspected three consumer bags per master. If you had one plant (33%) with decay, in your first sample, and no other defects in the remaining samples, you would have 4% decay for the lot.